With NFL teams off until the start of training camp in late July, there is not much going on around the league (outside of New England, of course). 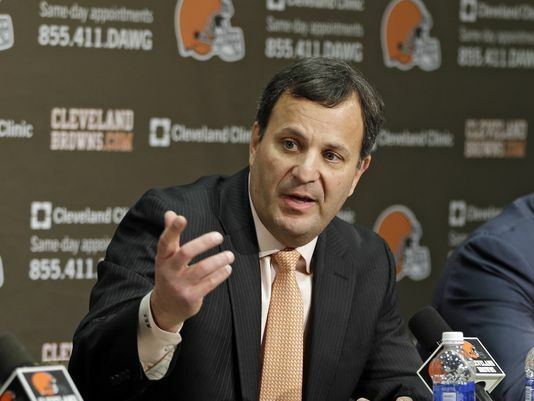 Which means it is the perfect time for Cleveland Browns general manager Mike Lombardi to do what he does best – get his friends in the media to make him look good. Yep, it really is that simple (or so Lombardi would have us believe). Of course, “high 40s” is a bit subjective – is 47 high enough? What about 46? – but we’re pretty sure Fortenbaugh was vague with his number because it tuns out, according to a chart accompanying the article, that the Browns averaged 45.3 combined rushes and passes in 2012 in compiling a 5-11 season. Now 45.3 may not be in the “high 40s” but it is also not in the “low 40s,” but to nitpick would be to lessen the genius of Mike Lombardi, and we can’t have that, can we? It should be easy enough for the Browns to hit the magic 50 mark this fall – all they have to do is train the wide receivers to run seven yards on third-and-six and they should see a few more plays each game, so you may want to start saving up the deposit for those playoff tickets. And let’s not forget this gem from last month on ESPN: first-half leads? Kind of important. Think special teams is one-third of the game? You’re right. Teams won 88.2% of the time when they hit five or more field goals in a game (15-2-0). (Oops, maybe the Browns should have tried a little harder to resign Phil Dawson). Then late today came this fun little number from Jason La Canfora at CBSSports.com, which basically sets the stage for Lombardi to throw up his hands and say, “sorry, I didn’t draft these guys” if things don’t work out sooner rather than later. Quarterback Brandon Weeden hasn’t exactly put a stranglehold on the job. Another quarterback, Brian Hoyer, was recently signed. (Yeah, because Lombardi has an unhealthy infatuation with him). There’s more nonsense in there that you can read for yourself. And friend-of-the-program Kanicki gives a paragraph-by-paragraph breakdown here. Bottom line, La Canfora’s article reads like someone sitting down with an agenda and then twisting the facts to fit a preconceived notion. We’ve been over this before; we obviously don’t want Lombardi to fail. But his track record is not the greatest (if we are being charitable) and he simply doesn’t have enough good will built up in this town to give him the benefit of the doubt. We also know the Browns were 5-11 for some very valid reasons last year, but a large part of that reason is now employed by the Philadelphia Eagles. This team should be better on offense this year simply because they will be running a real NFL offense. We’re just trying to hold on until training camp starts so we can put the nonsense aside and start focusing on something that actually matters. July 25 can’t get here soon enough.